I think the issue was that in Vanilla far more so than subsequent expansions you could engineer builds that were meant to destroy another character within the space of a single global cooldown. This is bad enough when you get ToEP/PoM/Pyro'd for 3.7k when you only have 2.9k hp once, but that's a niche-ish case due to requiring to raid to get ToEP so it's not likely on 2 characters. The PoM/Pyro bit though is possible by any Mage, and you don't need good gear for 2x of these to be an instant kill no matter the opponent. Any more than 2 is overkill but imagine being able to press 2 buttons and take out 2 characters at once because you have 4 accounts all multiboxed. It's not just Mages that can do this either, start stacking enhancement Shaman and you are more likely that a Windfury proc will occur, or stack Night Elf Hunters for shadowmelded Aimed Shots. If people are minding their own business then it's not a problem, but lots of people would go out of their way to grief. I'm actually not averse to multiboxing, I plan on doing it and consider it a fact of life, but I'm also going to play on a PvE server where I can't get ganked, so your mileage may vary. Go to to Kharanos right now and do the quest where you have to get Gears off the Troll Scavengers. That mob is limited and if the newbie area is busy and you can't tag the mob, you got a wait to complete that quest that blocks your progress to the next area. Now imagine the whole game like that with a single person controlling a Mage burn team that just runs through mobs before you can tag anything to just get some experience. That's just a group. I'm not saying all boxers are bad but this is what you get when you start allowing it. You also get a crazy economy as they farm dungeons over and over for items that they sell and control the AH market, ruining the economy. Boxing is not a good system to allow in an MMO. LIDC is some good software, they got their start giving away their software for free on Feenix. Software I used to great effect. ISBoxer is the only other multiboxing software I know off the top of my head. I totally agree that abusing any system is horrible. Yet dual boxing 2 characters for the fun of it should not impact either the market or the leveling experience of others. I have done it twice in retail without any problems or people getting angry at me. I simply minded my own business and leveled them up for the challenge that is dual boxing, not for gain or anything… However in Classic it would probably be both for challenge and gain, considering I would have 2 60s to help myself on. and dual computers in late Vanilla. Proper 5boxing on one computer in WOW and Rift since then with HKN(nice intro guide -- http://www.slashfocus.ru/hotkeynet) and IsBoxer. Generally you loose time multiboxing, due to XP penalty and gathering quests, compared to solo play. The benefit for me is that I can do dungeons when it suits me and take a break in the middle if something comes up. Very fun to solve some encounters too. Blizzard has nerfed follow in PVP, and everyone expect it to stay the same in Classic. It gains nothing for anyone when players feel abused in PVP by 5/10/20/40 boxers. I enjoyed 5boxing paladins in AV during WotLK, but my aim was the PVE aspect of it, not violating enemy players. 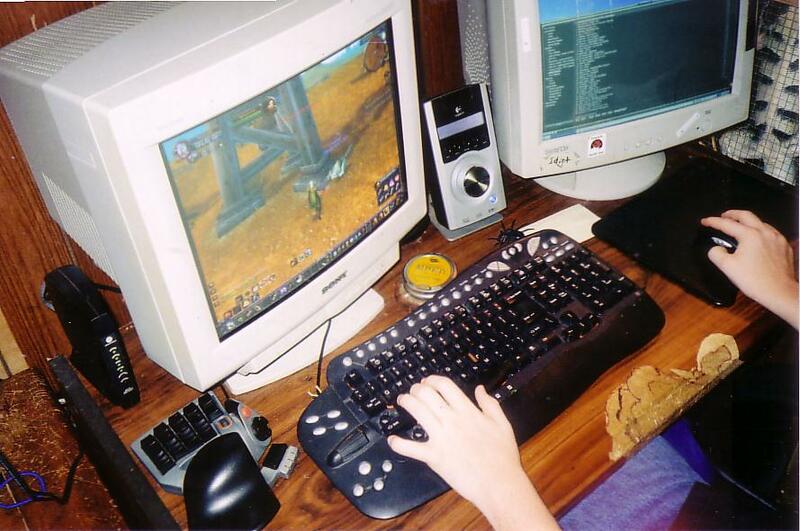 The reference site if anyone is interested, they also have some history of multiboxing there too - https://www.dual-boxing.com/forums/54-World-of-Warcraft Been my goto resource for many years. Some great info there, thanks @5bx! As time went on I got more and more accounts. I never did bgs because I didn't want to bother others with it, but I did 2box and 3box arena to farm gear for alts and, most importantly, to farm guild experience in Cata and MoP! You needed like 28 arena wins to hit the daily XP cap. My guild was at that point rather small, so as the leader I took it upon myself to farm everyone those convenient perks. So I did multibox arena until my eyes bled every single day until the guild hit max level. In the end I got pretty good at it so I could essentially boost my freshly dinged chars with my full pvp geared disc priest in 2v2 arena, until they had a decent arena set themselves. Obviously we're talking rather low rankings here. Don't think I ever got over 1500. Didn't work against combos with a healer that never went OOM obviously, as I could not at all apply pressure only playing one char at a time. Eventually I got hotkeynet and started doing arena with that, in WoD I think. But it got too expensive with all those accounts. I think I will do 2 accounts again in classic, but only for farming and such. Don't want to get that serious about it. It's just really nice to be able to boost your own chars, and you can 2man a lot of dungeons with 2 stealthers. This might change though - they've paid attention to tiny mechanical details like spell batching so far - perhaps this will receive the same treatment? Yeah the follow nerf in pvp made me fade out on multibox arena, as it became increasingly bothersome. That nerf was a pretty late change though, makes you wonder if they want to keep it for classic or not. As long as I can use it for my solo dungeons runs I'll be fine though. Generally they seem very sensitive to being faithful to the original way of the game, and are making adjustments with that in mind. However, to be honest I don't see what merits of "original vanilla game play" that will be protected by keeping /follow in bgs, from Blizzard's point of view. I could imagine this being one of the changes they wouldn't undo. I don't like it, there's my simple opinion on the matter. Multi-box on private servers, I'll report any multi-boxers I see on retail, call me a party pooper but I don't like it. As long as you aren't using any software to duplicate key presses to multiple running versions of the game it is legal. You have to manually press every ability for each character. So you can follow then alt+tab or use different computer to press all abilities. multiboxing is obviously bad for the game and is something only shitters do but blizz makes 5 times the fuking money who do u think they listen to?